This is a wonderful book, in every respect. It wears its (considerable) scholarship lightly. It tells a fascinating narrative. It brings to vivid life a galère of twentieth century musical greats whose need for practical help, encouragement, sponsorship and performance opportunities brought them into the life and Paris salon of Winnaretta, twentieth child of the US sewing machine magnate Isaac Singer. How she got from Yonkers to Paris (via the UK, in the form of a house in Paignton), how she – a lesbian – came to marry not one but two French Princes, divorcing the first and moving on to what seems to have been the ideal marriage of convenience, with Prince Edmond de Polignac, all this is merely the framework of what became a life dedicated to the promotion of music, the arts and – in the broadest sense – good works. 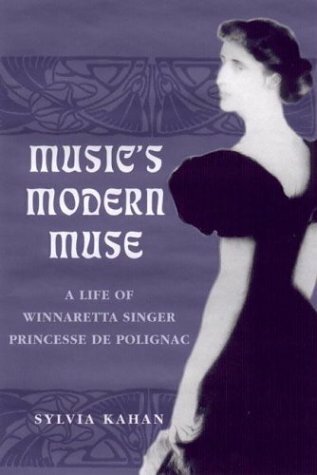 The book's title is apt: Winnaretta was undoubtedly a Muse, a very modern woman and a tremendous patron of music. Her story cries out to be told! And Kahan has done her full justice in a biography that has to be one of the best of its type I have read in recent years. Winnaretta was born on 8 January 1865. 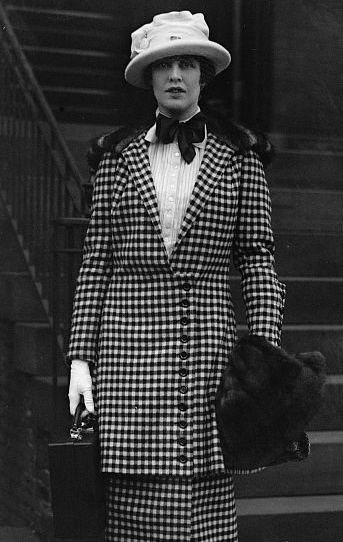 Her mother Isabella, born in 1841 to a French father and Scottish mother, was Isaac Singer's fifth serious romantic entanglement, the previous succession of wives and mistresses having produced a grand total of eighteen children between 1830 and 1857. Isaac and Isabella met in Paris sometime in 1862 in circumstances that vary according to different accounts – Kahan lists the various possibilities – and were married in 1863 in New York, six weeks before their son Adam was born. Eighteen months later Winnaretta arrived. Her parents at that stage lived in The Castle, a granite-built mansion set in several hundred acres on the outskirts of Yonkers north of New York, but nothing in the Singer family seems to have lasted that long – by 1866 they had settled in Paris, by 1870 (with the onset of the Franco-Prussian war) in England, initially in London and then in a purpose-built mansion in Paignton called The Wigwam. Kahan paints a lively portrait of life in the Singer household at this time, the eight year old Winnaretta being surrounded by theatrical entertainments, puppet shows and house music concerts organised by her mother and financed by her multi-millionaire father Isaac. The idea and the excitement of a musical salon may well have taken shape in young Winnaretta's mind at this time. Her 'story' really begins in the 1880s however, after the decision by her widowed mother to leave England and settle in Paris, Isaac Singer having died of a heart complaint in 1875. Here the pace of the book picks up. First, Winnaretta is left (aged 11) the huge sum of nearly a million dollars in her father's will, put initially into trust to await her majority. Next her mother buys a large house with a grand salon, to be used for musical and artistic gatherings at 27 avenue Kléber, and marries a Dutch violinist called Victor-Nicolas Reubsaet, the death of whose uncle gives him first the title of Vicomte d'Estenburgh and second, after the 'discovery' of some family papers, that of the Duca de Camposelice. Third, her new step-father (whom Winnaretta clearly disliked greatly) begins to eat into the Singer fortune by purchasing 'an extraordinary group of Stradivarius and Guarnerius violins, violas and cellos, eventually assembling a double quartet of Stradivarius instruments' and uses them to attract the finest performers in Paris for weekly chamber recitals in the Camposelice salon. This high level musical activity clearly made a huge mark on Winnaretta, introducing her to the great string quartets of Beethoven, Mozart and Schubert and helping to fashion what later became her extraordinarily fine and discriminating musical taste. In 1880 Winnaretta met Gabriel Fauré, got to know him and had the privilege of hearing, played privately, his latest compositions: she was 15, he 35, but a friendship clearly sprang up between them. Her refuge from home life with her mother and step-father, which she found increasingly irksome, lay in music (her piano teacher was Emile Bourgeois), painting and museum going, in the course of which she developed an interest in and a taste for the Impressionists. Kahan then skates rapidly over Winnaretta's later teenage years, marked by her developing an increasingly rebellious nature, until her complete financial independence in 1886, aged 21, when she started to purchase Impressionist paintings (first a Manet, then a Monet) and then, more importantly, a house of her own. Her choice actually ran to two houses, a mansion and a chalet, combining to form a two thousand square metre property on Avenue Henri Martin and on what became Rue Cortambert: and to go with the property she chose a husband, 29 year old Prince Louis-Vilfried de Scey-Montbéliard. They were married in July 1887. Ironically her hated step-father (who was quite possibly the main impetus in Winnaretta's rapid drive to complete independence from her mother) died a mere two months later. Kahan deals summarily but sympathetically with Winnaretta's short-lived, disastrous marriage to Scey-Montbéliard. Not only were the two sexually incompatible, they seem also to have had few shared interests. But possession of her own large mansion and of a titled husband was enough for Winnaretta to embark on what became her life-defining activity. Learning quickly from other society hostesses who ran salons of their own, Winnaretta established her own musical salon and became, effectively, an impresario with a predilection for the musical avant-garde. The list of composers and performers whom she met and whose works she sponsored is remarkable: apart from Fauré, the young Winnaretta was soon putting on concerts with works by Debussy, Chabrier, Reynaldo Hahn and other young composers from the Société Nationale de Musique, an organisation that had been founded by Saint-Saens to promote contemporary French music. And the works were not merely chamber music: Winnaretta put on two concert performances of Gwendoline by Chabrier with soloists, chorus and orchestra, an opera in which Chabrier had been trying in vain to interest the Paris Opéra for years. For music historians, the composition of the small orchestra for both performances is fascinating – apart from Chabrier on piano and Fauré on the harmonium, the percussion section was manned by Vincent d’Indy and André Messager! Winnaretta and Scey-Montbéliard separated after two years and were divorced by 1891, official annulment of the marriage by the Curia in Rome following in 1892. Her next marriage, to Prince Edmond de Polignac, was to prove not only long-lasting and truly affectionate (although once again both parties had no sexual compatibility) but artistically productive as well. Edmond was a composer and shared Winnaretta's interest and enthusiasm both for music and for painting: with the help of matchmaking friends they were married in 1893 and the golden years of Winnaretta's musical salon began. Kahan does the readers of her book an estimable service in listing in an Appendix a chronological account of some of the musical performances that took place in Winnaretta's house, and what extraordinary treasures are to be found there! With the always discreet help and support of Edmond, she not only put her salon on the musical map but also gave house room (and occasional financial support) to some of the twentieth century’s leading musical figures. Brief perusal of the index of names at the end of the book whets the appetite: from Albeniz to Kurt Weil, via Diaghilev, de Falla, Horowitz, Igor Markevitch, Poulenc, Prokofiev, right through to a tantalising encounter with Britten and Pears in 1942, when a commission may have been discussed. The range and breadth of Winnaretta's musical interests emerge as truly extraordinary. A review with a shopping list of names cannot of course do a 500-page book more than summary justice. It seems to me that Kahan's achievement is to put the musical story of Winnaretta Singer into its human and historical context, to create a character who comes across as indomitable, quirky, occasionally severe (and sometimes quite mean, despite her millions!) but above all passionate about the art of music and its development. Her human story and her long list of lesbian affaires and dalliances could become prurient in the hands of the wrong writer, but Kahan deals with all this admirably clearly and unemotionally. The result, as I said at the outset, is a wonderful book. May it prosper!